Showing 40 of 9371 results that match your query. Product - Top Shelf Flasks Premium Stainless Steel Hip Flask, 12 oz. 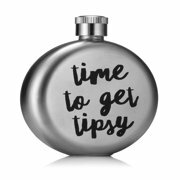 Top Shelf Flasks Premium Stainless Steel Hip Flask, 12 oz.